The LSbet Sportsbook was founded back in 2012 and has quickly gained traction in the online betting world, mostly due to excellent bonuses, top notch customer support, and the overall solid services they offer. LSbet is licensed in Curacao and the license is held by Media Entertainment NV, Curacao. The first impression with LSbet is a well proportioned, clean looking website which is probably one of the best out there for beginners. The design is both very functional and in good taste, and usability is great. The desktop version isn`t the fastest out there and that`s probably the only weakness, but it still moves reasonably well and it shouldn`t bother you. LSbet has a top notch welcome offer. You are greeted with a 100% first deposit bonus up to 120 Eur and the rollover terms (6 times on odds above 1.80), as well as the country restrictions, are reasonable (link with T&C’s). It is one of the few solid, straight up welcome bonuses still on the market and if you read the Terms and Conditions you shouldn`t have any problems. One other interesting bonus is a 25% bonus up to 250 Eur if you make a deposit on Friday. 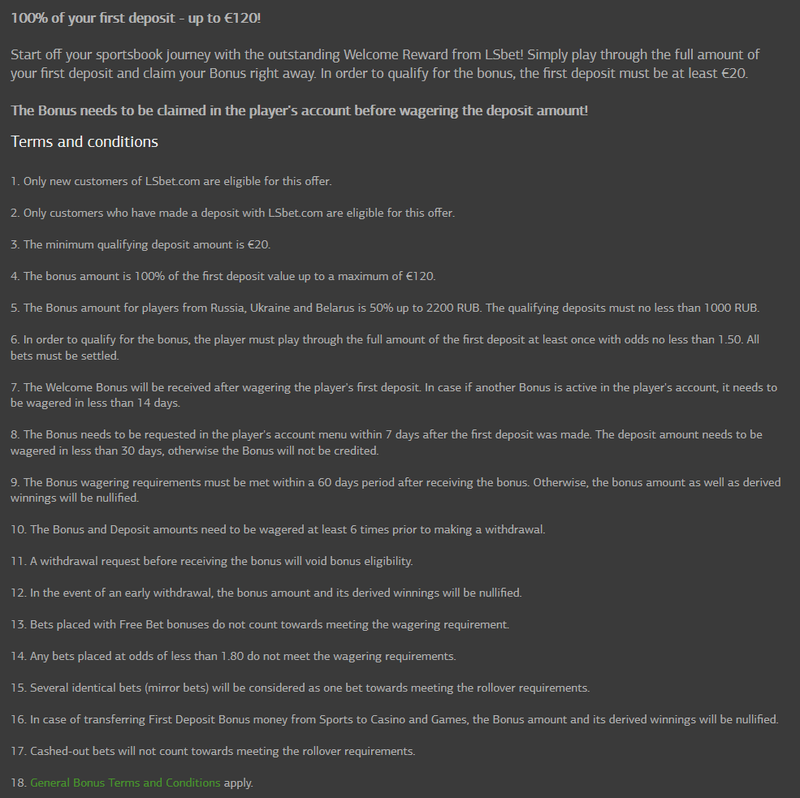 You need to wager your deposit amount on odds over 2.00 in order to get the bonus. 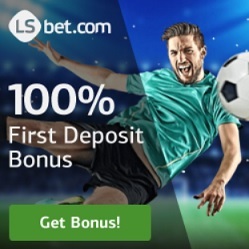 There are also tons of other bonuses and promotions at LSbet, including weekly freebets for betting on certain events, or loyalty freebets after, for example, betting 8 times on football or ATP / WTA tennis. There are also cashbacks, reload bonuses and accumulator bonuses, all of which are well explained in the promotions tab on the LSbet website. It has to be said though that often you will be limited on the profit you can make for such freebets, usually to 50 Eur (it`s written in the terms and conditions for each promotion). All in all this Sportsbook is recognized for excelling when it comes to bonuses. It is their strong spot, through which they aim to retain customers and make it worthwile for them to keep betting with LSbet – so it`s no surprise that there are so many good offers available. And it`s no small thing that those offers have clear and concise terms which can be understood clearly. Odds at LSbet are competitive, but no more than that. On lesser competitions the prices can be just slightly below average. Handicap margins are generally between 1.85-1.85 and 1.90-1.90, which is not bad. Regarding betting coverage, it`s Ok. You get 20 something sports to bet on and plenty of events. Particularly on tennis LSbet is pretty impressive, with tens of low level ITF and futures events every week, including doubles. However, they don`t go as far as to cover things like let`s say the Chinese second division in football, just to give an example. As for betting types and handicaps, you will generally get around 100 betting options for the big events, including plenty of asian handicaps. That`s well below some of the top bookies, but it`s not bad and it should be satisfactory unless you have unique preferences. For lower level events they could do much better, for example Romanian football league matches only have around 15 betting types attached. It`s safe to say that in these categories LSbet falls right around the average. Not bad, not great. Limits at LSbet are generally very high. They say they do not even set limits, although that`s probably only half true. There have been reports of players complaining they have been limited, but that is valid for every bookmaker. Even the famous no-limit Pinnacle has been accused by many people online in this regard, so there will always be somebody who is not happy. You can deposit through a variety of methods: Credit Card, Bank wire, Skrill, Neteller, Paysafecard, AstroPay, Sofort, Eco, Transferencia, Multibanco, Nordea, Rapid Banco, Neosurf, Boleto or PayKwik. Minimum deposit is usually 10 Eur with the exception of a few of the deposit options. You can withdraw through Credit Card (minimum 25 eur), Bank Transfer (100 eur), Skrill (10 eur), Neteller (10 eur), Transferencia (100 usd), Eco Card (10 eur) or Rapid transfer (20 eur). To be quite fair our mobile betting topic in reviews is becoming a bit obsolete. It helped back in 2013, but in this day and age all bookies have dedicated mobile platforms and 99% of them work the same: very good. That is also the case for LSbet. 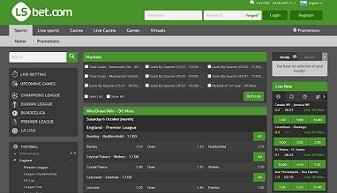 Similar to their odds and betting coverage, LSbet`s live betting product falls around the average. Good, not great. The platform is very functional, reliable and friendly. You will obviously find all the notable events and there will always be something to bet on, day or night, and there will be enough betting options available for each game unless it`s a small event. You will get things like tennis ITF`s, American football college games, or football leagues like the Mexican second division. But overall LSbet’s live betting offer falls a bit short compared to the top bookies in the game. Customers service is one of the strong points at LSbet. You have 24/7 support via e-mail, telephone (free) or live chat. There is also a useful FAQ section. Not only this, but the staff is friendly, helpful and reliable, which is always the most important thing. You can give LSbet an A+ in this department without any worries of overrating them. This is a Sportsbook with top notch bonuses and A+ customer support, with an easy to use and secure website, and with average / competitive odds and betting coverage. LSbet is a bookie which knows what it`s about, and they do not have notable flaws, which is important. I would definitely recommend LSbet for beginners, but they are probably a solid option for everybody who doesn`t want the best odds on the market or fancy betting types on lower level events. Join LSbet Sportsbook and claim a 120 Eur (100%) welcome bonus now! LSbet bookmaker review by Betdistrict ©. Updated monthly.